The U.S. resettles over 50,000 refugees each year. Some celebrated Christmas before coming to the States, others didn't. But once they're here, Christmas becomes a time for family to come together, simply because it's a holiday where cities shut down, and most people have the day off from work or school. 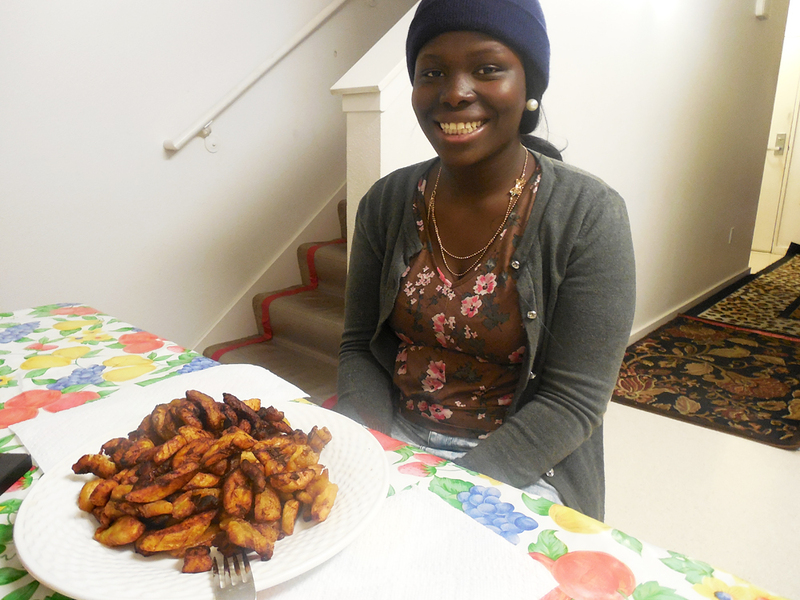 Many refugee families cook, eat, and celebrate during the holidays, but they do it in their own way, with their own traditional foods -- like 18-year-old Patience Wilson and her family. They came to Oakland as Liberian refugees eight years ago. Wilson says she had a bit of culture shock when she saw how Christmas is celebrated in the U.S.: lots of decorations, and even more lights. Back in her Liberian refugee camp in the Ivory Coast, Wilson says Christmas was a time for the entire community to come together, not just family. It was one huge party, and everybody was invited. As a kid, Wilson says that was her favorite Christmas activity. At the end of the day, the whole neighborhood would gather to make music. 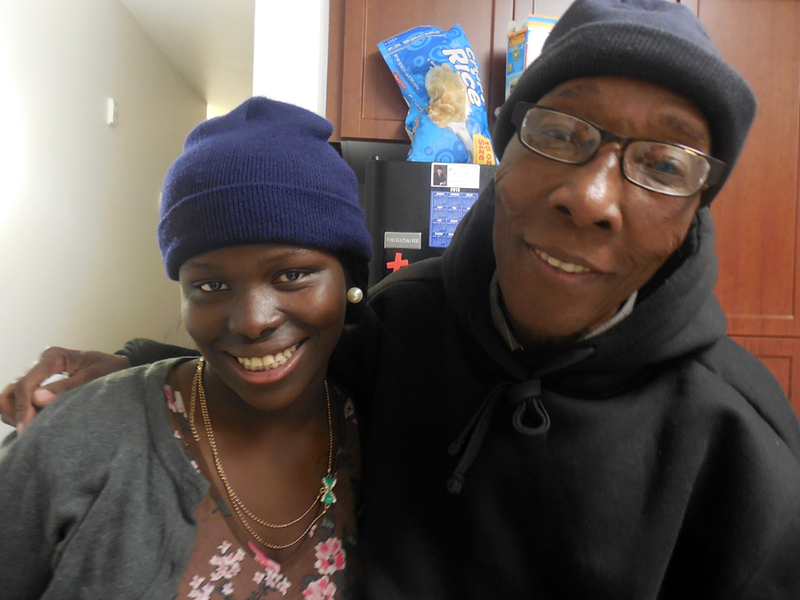 Patience's grandfather, 74-year-old Robert, comes into the kitchen and sings one of those Liberian Christmas carols. Robert brought Wilson and their family to Oakland when Wilson was 10 years old. She's now a senior in high school. Her grandparents left Liberia during one of the countries civil wars because Robert was from the Kranh ethnic group, and his was wife was from the Grebo group -- and the two factions were fighting. Wilson was raised in a Liberian community in an Ivory Coast refugee camp known as 'Peacetown.' In the past decade, over 600 Liberian refugees have resettled to California, and a few hundred now live in Oakland. In the Peacetown refugee camp, they lived off food rations, but would trade with locals for luxuries like yams and plantains. Wilson says for the holidays, they'd go all out. “We’d make fried rice, we called it jarov rice. We fry chicken. We make a lot of different soups. There’s this rice it’s kinda green, we call it chuck rice,” says Wilson. Wilson says she'll be making one of those plantain dishes for Christmas dinner here, and begins to prepare it in her kitchen to demonstrate. 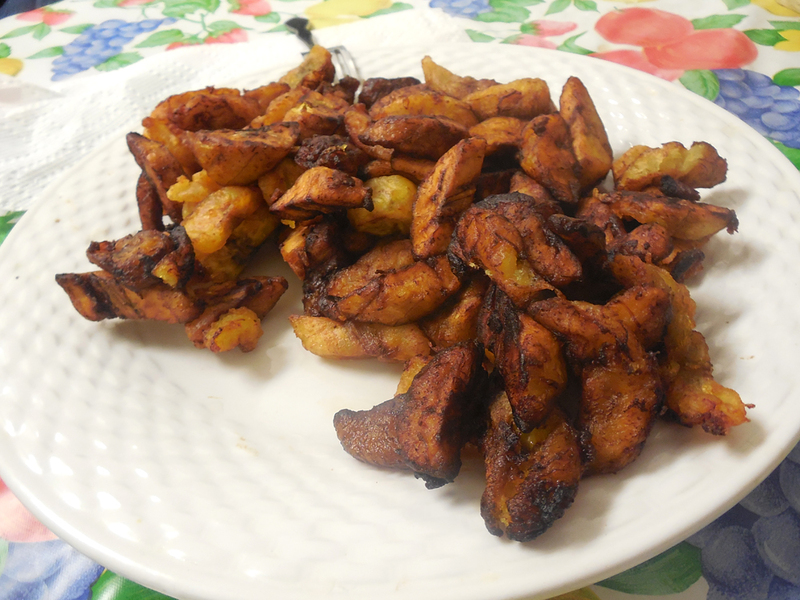 Wilson chops up the plantains, cooks them in hot oil, waits until they brown, then serves them to her grandfather to see if they're up to par. Robert takes a bite and proclaims loudly that they’re perfect, which makes Wilson smile. Lauren Markham says food is a refugee's connection to her homeland. She works with refugees around the globe, through a San Francisco-based group called Refugee Transitions. Markham says she's always offered food when she visits refugees in their homes, and she never refuses a bite -- because food is a way to strengthen self-esteem, especially among newly arrived refugee women. Markham says families learn very quickly where to buy their cultural food. She says refugees are happy that the Oakland area has many ethnic food markets available. Markham often asks refugees for recipes, and she says they're always thrilled to share -- it's a chance for them to reverse roles and be the teacher in a foreign land. That's what inspired Markham to make a refugee cookbook, called Between Meals. It’ll be released in February, with most of the proceeds going the refugee women in the Bay Area who contributed recipes. Markham says refugees struggle to find the balance between retaining their own cultures, and assimilating to those in the U.S. -- like the American Christmas. 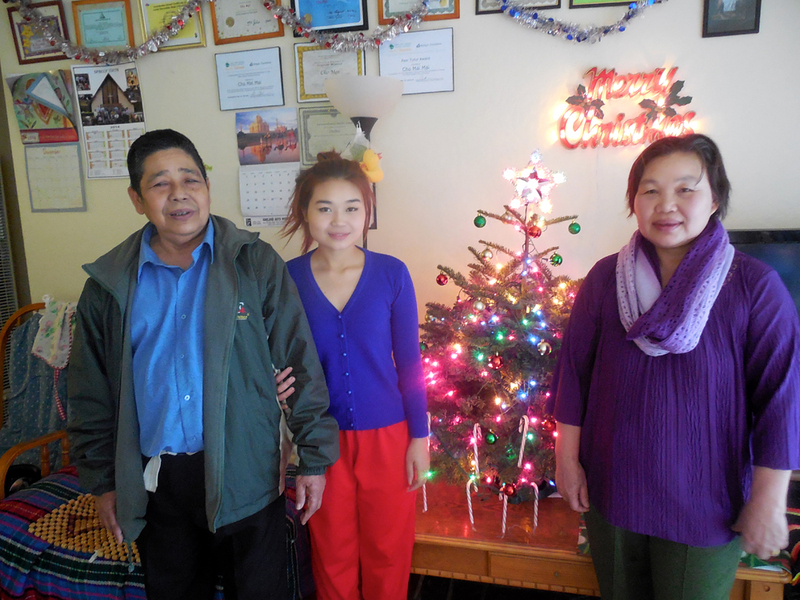 Twenty-one year old Cho Mei and her family have fully embraced Christmas. They're Karen refugees, an ethnic minority in Burma. She says her family was Buddhist, but they would celebrate each year with their Christian neighbors in her refugee camp in Thailand. “In Thailand if you put a candle in front of your house, and people come sing in your house, and you can give like candy, a little bit gift,” Cho Mei says. Cho Mei's family fled Burma because many Karen people are tortured, raped and forced into labor by the Burmese government. They relocated to a refugee camp in Thailand that borders Burma. But once they got there, Cho Mei says they were practically treated like prisoners. But Cho Mei’s parents and her older brother would secretly venture out of camp at least once a year. She says the UN provided food rations, but not enough clothes. Plus they need money to send Cho Mei to the school in the refugee camp. After nine years in the refugee camp, Cho Mei's family relocated to a Burmese neighborhood in Oakland -- 200 Burmese refugees have moved to the county in the past five years alone. Over 37 hundred Burmese refugees have relocated to California in the past decade. A large number of Karen in Oakland are Christian. So Cho Mei's family soon adopted that religion as their own. Cho Mei's mother, Naw Htoo, goes into the kitchen and boils water to prepare one of her holiday dishes -- a traditional Karen soup with lemongrass, lime and chicken called Da Klah Chi. 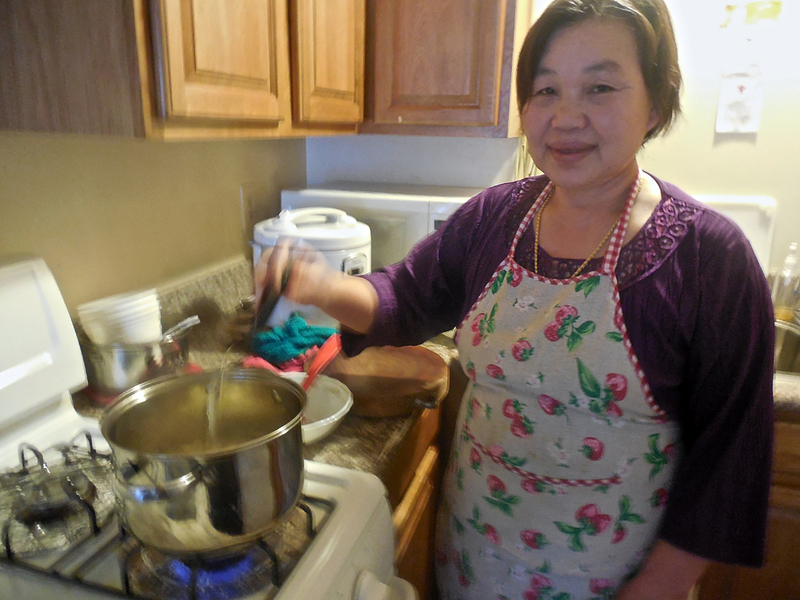 Cho Mei's family still cooks Karen food on Christmas. Even though they've converted to Christianity, they still hold onto their Burmese heritage through food. Cho Mei says she goes Christmas caroling with her Karen church members in Oakland, but they sing in their own language. Cho Mei’s family bought their first Christmas tree this year and put neon ‘Merry Christmas’ sign on their wall. Patience Wilson, the Liberian refugee, is also buying her first Christmas tree with money she's saved from her after-school job. Both girls and their families will get December 25 off -- and that's reason enough to celebrate. Between Meals includes recipes from Afghanistan, Eritrea, Liberia, Somalia, and different Burmese ethnic groups. Here’s a sneak peak at one of the recipes in the cookbook -- a chicken and lemongrass soup made by Cho Mei’s mother, Naw Htoo. About half a 7-oz package of shahe dried rice noodles (found in Asian store; they’re about half-an-inch wide; use as much as you think guests will eat as crispy topping for noodle dish). Put the hard-boil the eggs in water; cool, peel, and set aside for later. Stir-fry the small chicken pieces in oil with salt and turmeric. Stir-fry the chopped onion in oil with paprika. Fill a large pot with the 4 quarts water. Add the chicken broth powder and stir. Add the mung beans and stir. Add the 10 garlic cloves and stir. Add the stir-fried onions and stir. Bring to boil over high heat. Lower to medium heat and cook about 30 minutes, until the mung beans are soft and losing their shape. In a different large pot, boil the yellow Chinese noodles in enough water to cover them; cook until they are soft/al dente. Drain. Meanwhile, in a wok or deep pan, heat 2 1/2 cups oil on high heat. By the handful, drop in a batch of the dried rice noodles. (Be careful of splatters.) Stir constantly until crisp and beginning to brown. Remove with a slotted spoon and repeat until all have been fried. Put in a large bowl for the table. Prepare the toppings as described above while you wait for the noodles and sauce to finish. Put each topping in a separate dish for the table. Put noodles and sauce in separate large bowls on the table. 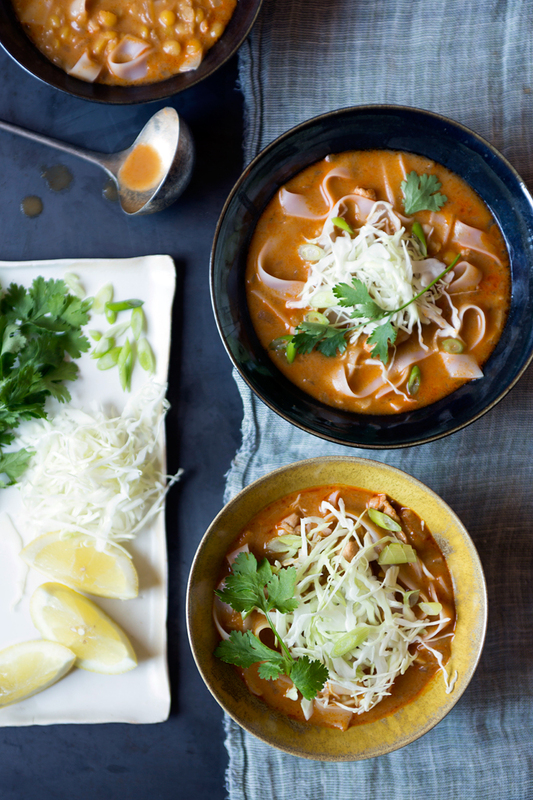 Each person serves him/herself noodles and ladles sauce over them, then tops with toppings as desired, including coriander, squeezed lime juice and crispy rice noodles.